NASA Earth Observatory image by Joshua Stevens, using VIIRS day-night band data from the Suomi National Polar-orbiting Partnership. Story by Adam Voiland. No, this is not an image of a jellyfish drifting in the ocean’s twilight zone. 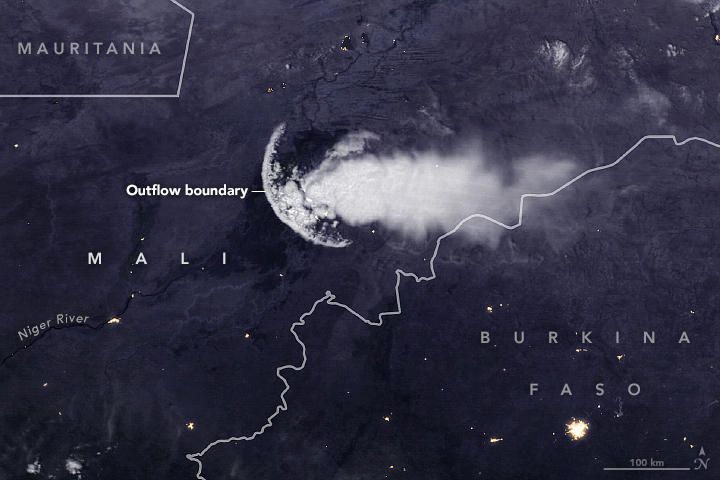 It is a satellite image of a cloud hovering over Earth’s surface at night. The peculiar shape is the product of an outflow boundary associated with a decaying thunderstorm over Mali. Thunderstorms often develop on hot days as warm air rises and the moisture condenses into towering cumulus and cumulonimbus clouds with downpours and lighting at their centers. The falling rain cools the air and creates a downdraft that spreads outward in a circular fashion once it reaches the ground—much like pancake batter spreads out after being poured onto a griddle. The outflow boundary, sometimes called a gust front, is the leading edge of a spreading pool of cool air near a thunderstorm. Outflow boundaries can persist for many hours after a thunderstorm, and they can travel hundreds of kilometers from where they formed. Gust fronts sometimes carry ominous-looking shelf and roll clouds that signal the arrival of stormy weather. In dusty areas, they can stir up walls of dust known as haboobs. Outflow boundaries can even sweep up enough flying insects, birds, and other debris that the collection of creatures and debris shows up on weather radar. The choppy winds in outflow boundaries can pose serious problems for aircraft trying to take off or land. 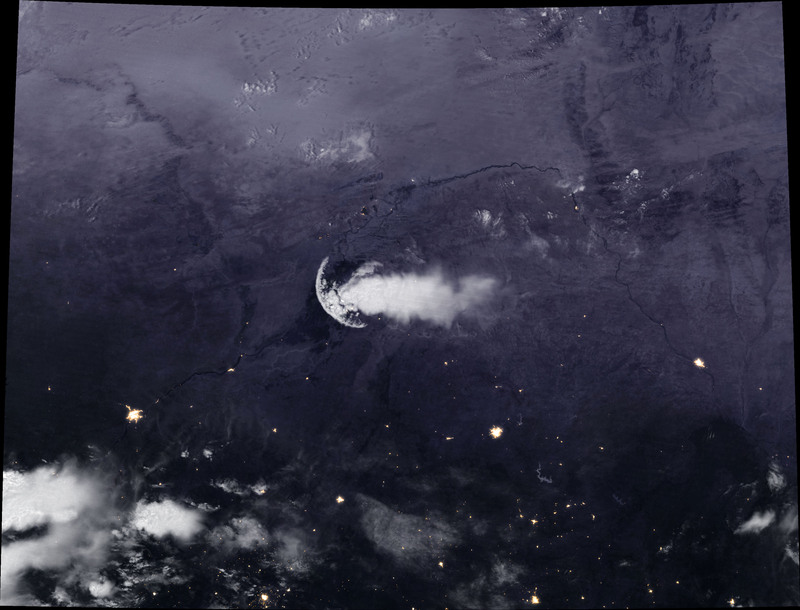 The image was acquired by the “day-night band” (DNB) on the Visible Infrared Imaging Radiometer Suite (VIIRS) on Suomi NPP early on September 27, 2018. The DNB sensor detects dim light signals such as auroras, airglow, and city lights. American Meteorological Society Outflow boundary. Accessed October 3, 2018. Penn State Outflow boundaries. Accessed October 3, 2018. The Washington Post (2018, August 7) Why weather radar appeared to show a massive explosion over the D.C. area Monday. Accessed October 3, 2018. Weather Prediction Thunderstorm Outflow Boundaries. Accessed October 3, 2018.